Editor's Note: Our editorial philosophy was updated October 23, 2017 to reveal more of our own biases (no one is unbiased) as we work to provide a broad, balanced view of news and issues in the face of growing media bias, polarizing filter bubbles and an increasingly divided society. We also felt it was important to point out that we have a bias in favor of free speech and freedom of the press, although, as part of our commitment to providing all sides, we also cover perspectives that promote limiting both of these First Amendment rights. AllSides displays the news as it is covered from a breadth of perspectives. That includes different perspectives on the same story, as well as different opinions on the day's top stories. We also seek to provide context, revealing debate on the underlying issues and other helpful background. We refrain from choosing the top stories ourselves; rather, we seek to reflect the top news as other media outlets are covering it. Your participation helps us to achieve that. We do, however, add some editorial bias of our own. We believe everyone is biased, including us, and it is important to be transparent about bias. We give voice to perspectives often ignored. We don’t just show Left, Center and Right perspecties, but also perspectives representing everything from Socialist to Libertarian, Blue-dog Democrat to Mainstream Republican, Liberal to Social Conservative. (See the 8 distinct groups that Pew Research has identified.) That means stories that might be missing entirely from leading news sites but are top headlines for a specific group will often appear on AllSides. We give extra attention to news with contrasting coverage. We have seen mainstream media coverage that differed so widely that it is hard to believe they were reporting on the same event — including elections, terrorist acts, economics, Occupy Wall Street, and conflict in the Middle East, to name just a few. We give these stories extra emphasis to be sure you have the full picture to understand what is really happening. We highlight stories on polarization and media bias. AllSides aims to reduce dysfunctional polarization, so we can work together and solve problems. Revealing media bias and exposing people to different points of view helps to achieve that aim. Raising awareness and understanding of polarization and bias supports this worthy cause. We highlight free speech and civil discourse. We cannot bridge divides and solve problems without listening to each other and sharing our thoughts. This requires a free flow of information and free speech, so that ideas (both good and bad) are heard. It also requires civil discourse, so we can relate and empathize with each other. We focus, at least for now, on political news. There are many other topics, like health, finance, parenting, ethics, and products, to name just a few, which would benefit from exposing different perspectives and bias. We see the most urgent need and biggest opportunity for change in the political world, so we have started there. AllSides empowers people to be informed, understand and decide for themselves. Without exposure to different points of view, we can be manipulated into believing and acting in certain ways. When well informed, we are better equipped to solve our problems and build “a more perfect union." 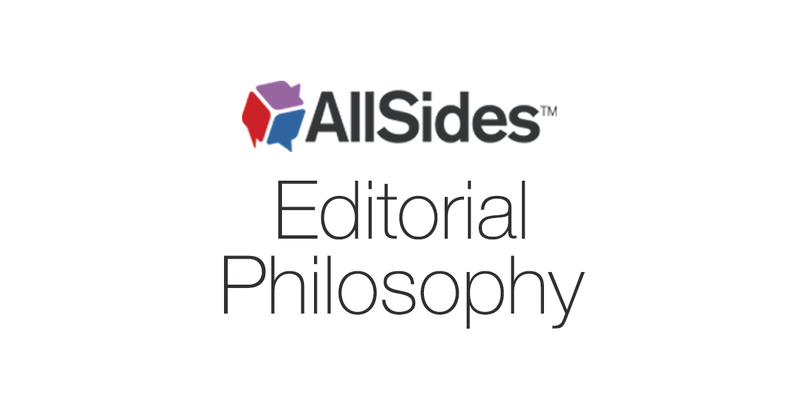 Overall, AllSides News, Issues and Perspectives support the broader AllSides mission to "free people from filter bubbles so they can better understand the world — and each other." Our editorial philosophy helps us to put this mission into daily practice. John Gable is the CEO and Founder of AllSides and co-founder of AllSides for Schools. View our balanced news and media bias ratings.